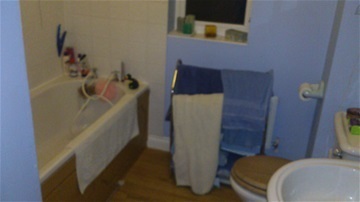 Before - a shower is needed, as is a general update and refurb. 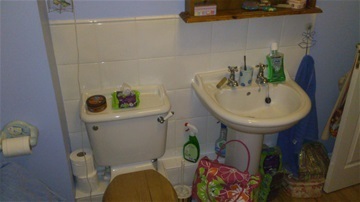 Before - the lack of surface space made the bathroom feel crowded and cluttered. After - contrasting tiling with the dark flooring gives the room a clean, sophisticated finish. 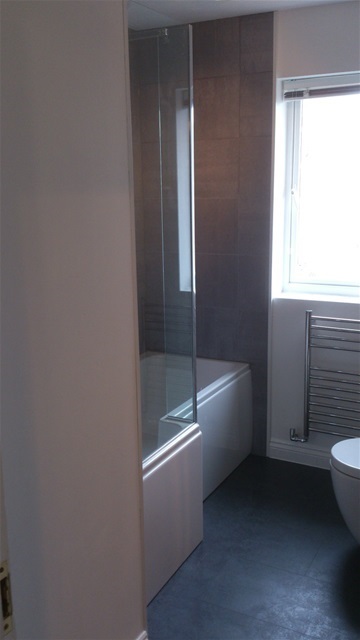 After - an L-shaped bath provides ample shower space in what was a full room. After - the mirror bounces light from the window into the room. 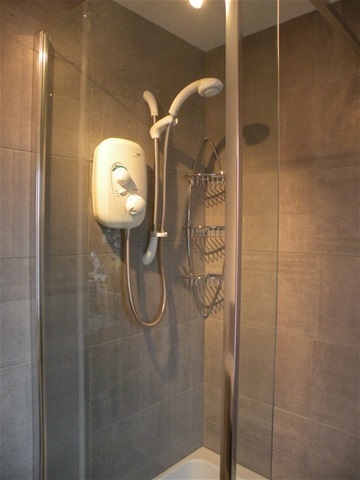 After - the new electric shower ensures endless hot water in a 'proper' shower. After - the wall cabinet maximises storage, while the wall-hung loo creates a greater feeling of space. After - the L-shaped bath is double ended, so nobody 'gets the taps'. 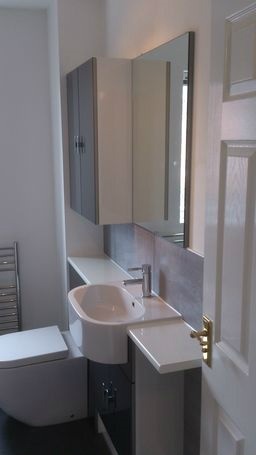 The owners and their teenage children wanted a new modern, fully functioning, clutter-free bathroom. There was no need to drastically change the layout, so instead we swapped the original bath for an L-shaped bath with electric shower overhead (no more running out of hot water!). An elegant single sink unit with wall-hung toilet created clean lines and more surface space, while the wall hung cabinet provided plenty of storage. Floor to ceiling zoned tiling further helped to minimise visual clutter. The family love their new bathroom. So much so, we were asked to come back and refurbish the master bedroom ensuite.